CHICAGO, September 17, 2010 – An estimated 2,000 fans cheered. 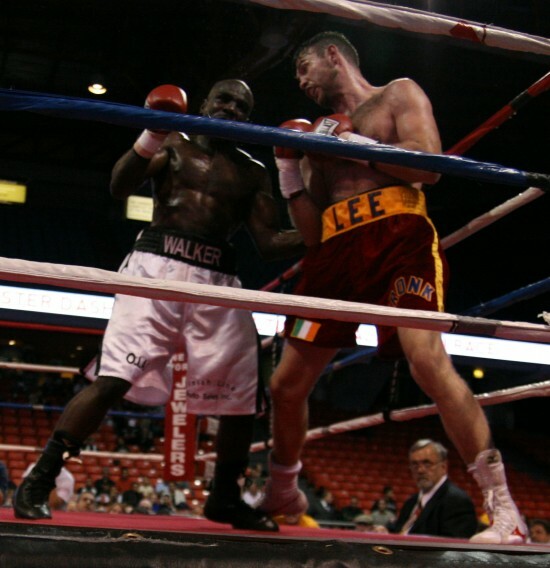 Tonight, Ireland by way of Detroit, Michigan’s Andy Lee (162 lbs., 22-1, 16 KO’s) showed flashes of brilliance and took another step closer to the upper echelons of boxing, as he halted Chicago’s rugged Michael “The Midnight Stalker” Walker (19-4-2, 12 KO’s) at the UIC Pavilion. David Diaz (below) tosses up a medicine ball to trainer Mike Garcia in preparation for his fight versus Humberto Soto this Saturday night for the Vacant WBC Lightweight Title versus Humberto Soto. They will fight on the same card as Manny Pacquiao vs. Emmanuel Clottey. CHICAGO, IL — In preparation for his upcoming bout versus Humberto Soto for the Vacant World Boxing Council Lightweight championship of the world, David Diaz held court at JABB Boxing Gym last week. His fight will be one of the featured bouts on Saturday, March 13, at Cowboys Stadium in Arlington, Texas, where the main event will be Manny Pacquiao vs. Emmanuel Clottey in the main event. Portions of the show will be broadcast on HBO Pay-Per-View.